Yesterday I took my own advice and really celebrated my own happiness. For me, this took the form of doing things that I enjoy. It greatly pleased me to go to Tai Chi class in the morning and then spend an hour filling my planters with flowers. I totally love that bright teacup design. I can’t wait for the second planter to arrive. After planting yesterday, I jumped into the pool for some exercise and also pool cleaning. My little pool makes me happy. I love being able to go in to exercise or relax whenever I want. After that activity, I showered and headed down to Key West (about an hour away) for a little shopping. You know those folks who find it recreational and fun to browse in malls for hours on end? I’m not one of them. I really have to be in the mood and have specific goals. Yesterday, I wanted to visit Pier One in search of a small table for the porch. I also wanted to shop a store that had a good selection of sneakers/walking shoes. The last couple of times that I’ve purchased sneakers online, I haven’t been happy. I wear a 10 EE and even when the manufacturer specifies that they do wide-widths, the womens’ styles end up crowding my toes. It is very difficult to walk any distance or do any extended activity if your toenails hurt! There isn’t much difference in style between the footwear made for men or women, so I thought it was a good idea to visit an actual store and try on different pairs before buying. The salesperson was very helpful, although he really wanted me to at least try the electric day-glo yellow walking shoes. He finally accepted that I wasn’t, in his words, “feeling them” and brought me a few other styles. I walked around the store in each pair before finally settling. Mission accomplished! Traveling on to Pier One in the next shopping plaza down the road, I spotted a charming, colorful, sort of funky woven table with a large woven daisy in the center. The decorating scheme for my porch has swiftly become eclectic. Nothing matches in style or color, but somehow it’s all going to work — from the eggplant finish of the plantation-style chair and ottoman to the white Adirondack style rocker to the (once it finally arrives) off-white wicker loveseat with the midnight blue cushions. All of these, remember, sit on a porch recently painted deep blue in contrast to the lavender of the house itself with the bright white columns and railing. If all of the elements together don’t qualify for a layout feature in Outdoor Living Designs Magazine, I don’t care. The pieces are comfortable and they make me happy. While in Pier One, I wandered around just for fun. They really stock a lot of whimsical items. A set of china measuring cups caught my eye. I don’t need them for cooking, but I immediately thought that they would make great, small cups for me to eat from. I can measure my portion and serve myself in the same piece! Next to them on the shelf sat an adorable deep purple-blue berry colander. When I buy berries, I don’t immediately wash the entire container. I rinse what I want as I’m ready to eat them, so having a smaller colander, rather than always pulling out one of my bigger ones is a perfect idea. Did I absolutely need this thing? No, but between the cuteness, color and potential functionality it made me smile, so I bought that too. Just look at these things. Who could resist? A little while ago, I spooned low fat yogurt into the 1/3 cup measure and sliced up the berries for a snack. I know it would have tasted just as good in a plain white ramekin, but my overall pleasure was increased because it looked so darn pretty in the little flower bowl. After I finished shopping, I met up with a friend who lives in Key West. We then picked up another friend who’d just flown in. My friend Em has heard me speak about wanting to find restaurants that serve small portions of really flavorful food. She suggested we go to dinner at a place in town that serves a Tapas-style menu. My friends, this experience was so terrific, I now fervently wish someone would open a similar place in my town. The menu offerings were amazing! Three or four soups and several salads, which the server said were large so one was usually shared by a party. Then they had at least 15 cold tapas offerings including an exotic cheese platter, hummus plate, different veggies and many other things. The hot tapas selection was even greater. I didn’t count the choices, but there were at least 20, maybe 25, representing many different cuisines. Everything sounded absolutely delicious and it took awhile for me to narrow it down. I finally decided on two, knowing that I wouldn’t finish them, but craving the opportunity to try a variety. For my first plate, I chose dates stuffed with goat cheese, wrapped in proscuitto. Pardon me while I sound like a Food Network chef, but the crisp saltiness of the proscuitto paired with the chewy sweetness of the date and the creamy tang of the melting goat cheese combined for a small, flavorful bite of joy. There were six on the plate, of which I ate three. For my second choice, I opted for herb crusted beef tenderloin with a topping of melted bleu cheese. Picture a small round filet mignon sliced crosswise into thirds and you’ll have an idea of the portion size. It was a tender, perfect medium-rare serving with delicate herbs and just enough bleu cheese for extra flavor depth. I savored the three bites that I ate after the three dates. I had a bite of my friend’s croquetta and was full. The only thing better than that tapas meal was knowing that I could take home the rest of the meat and dates to enjoy a second time! My friends and I chatted, laughed and thoroughly savored our meal. It was such an enjoyable evening. I found myself smiling about it for most of my ride home. After a leisurely morning sitting on the porch with a cup of tea, the Sunday newspaper and my dogs, I ventured out to do my food shopping for the next few days. I’m trying a recipe in the slow cooker with chicken breasts, low cal honey barbeque sauce and fresh pineapple. I’ve noticed that if I eat chicken, it has to be really, really moist or I have problems. My friend told me about this dish and swears that the chicken is fall-apart tender, so we’ll see. On my way to the supermarket, I stopped by Home Depot for two bright planters for my gardenia bush and my small Meyer Lemon tree. Yes, more color for the porch! I finished repotting a short time ago. It’s the middle of the afternoon and I’ve completed the things I really wanted to do on my Sunday. The Phillies are playing the Braves and TBS is carrying the game, so I have a chance to see my Phils in action. (They’re having a horrible year, but I still love being able to watch a game.) I’m going to pick up my sequinning, settle into the recliner and watch the rest of the game. It will be one more way to make myself happy on what has, so far, been a really terrific weekend. I looooove tapas. I think I might need to suggest that we get some this weekend. Sounds like a fantastic weekend and a fantastic day! I love tapas and wish I could find them here. I’m sure there is a tapas restaurant in the city somewhere, but I don’t want to go try it out alone. I’ll eat some places alone, but other places I prefer to try out with someone else. I’d like a Meyer Lemon and an aloe to grow inside the apartment. Yes, I know that this is Houston and they can both grow outside, but I’d like to have their wonderful selves inside where I can enjoy them. My deck is right next to 6 or 8 AC machines for the surrounding apartments an it’s on the first floor, so my deck isn’t the most wonderful place to be right now. When I get an income to pay for movers, I’m moving to a second floor apartment so 1) I’m further away from the bugs, and 2) I’m further away from the AC units. I, too, want pics of the filled out porch. It sounds awesome! Mmmm! Tapas! We visited Washington, DC with my parents one long weekend and were walking trying to find somewhere to eat and found a fabulous tapas restaurant. We had such good food and shared it all around – so fun! I’m having total porch envy as we still have gravelly, weedy, dirt where our sunroom, patio and deck are supposed to be. Waiting on the no further action required letter from the state to be able to start the construction. Very cute stuff from Pier 1. I’m not a shopper at all but I do love wandering around in that store, particularly at Christmas. 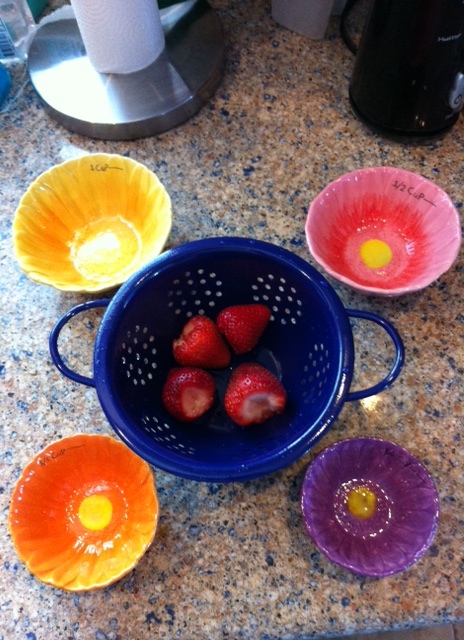 Those measuring cups are adorable, and I loved yesterday’s planters too. Don’t forget to give us pictures of your eclectic porch when you’re done. The tapas sounded delicious. I want to try the date, goat cheese, and prosciutto one. You mention the goat cheese was melting, so I assume they were baked? Glad you are having a terrific weekend, Mary.